T20 World Cup 2009 Final was played on 21st June. After the finals of ICC World Twenty20 2009, Pakistan emerged as the winner. 21st June 2009 witnessed the final of T20 World Cup 2009, the second session of the Twenty20 World Championship. Sri Lanka won the toss and decided to bat first. TM Dilshan and ST Jayasuriya came as the opening batsmen. However, Dilshan fell to Mohammad Aamer's excellent bowling, that too without scoring a single run. Thereafter, it was the turn of J Mubarak, who later proved another duck out, at Abdul Razzaq's delivery, caught by Shahzaib Hasan. Reeling at 02/02, Sri Lanka got a respite in the form of Sanath Jayasuriya, who hit 17 runs, off 10 balls. However, the breather did not last long and soon, he also lost his wicket. Mahela Jayawardene followed soon after, as his shot went right into the hands of Misbah-ul-Haq. By this time, the team had only 32 runs and was down by 4 wickets. However, Sangakkara and Chamara Silva managed to bring back some life into the game, adding some crucial runs. Silva, after being caught by Saeed Ajmal, went out of the game and was succeeded by Isuru Udana. Even Udana could not last long and became a victim of Shahid Afridi's bowling. With this, Angelo Mathews came onto the field. He, along with Sangakkara, took the score of Sri Lanka to 138/6, from 70/6. The innings came to an end with 17 runs being scored in the final over, bowled by Mohammad Aamer. Pakistan started its innings on a good note, with Abdul Razzaq and Shahzaib Hasan as the opening batsmen. They took the score to 48, before Kamran Akmal was stumped by Kumar Sangakkara. After that, Shahid Afridi came on the pitch and soon even Abdul Razzaq was out of the game. Finally, Shoaib Malik joined Afridi and they took Pakistan to victory, reaching the target in 18.4 overs only. 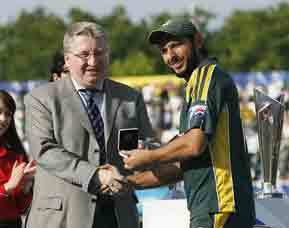 Shahid Afridi was declared the 'Man of the Match'.